We at the Vision Center would like to wish all of you a very safe and happy Independence Day. Take extra care to protect your eyes, and your vision, as you watch and light off fireworks. Abrasions, burns, cuts, optic nerve damage, retinal detachment, and blindness are all injuries that can occur while lighting off fireworks. Even seemingly harmless fireworks such as sparklers, can be a danger to you and your family, and account for 10% of all firework related injuries. Remember that children should not be allowed to play with fireworks of any kind. If an eye injury should occur, seek immediate medical help. You can find more information on Firework Display Safety here. 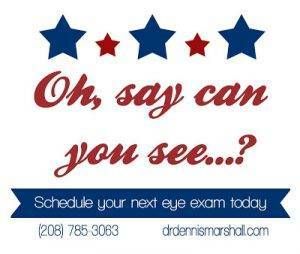 As always, we are happy to help you with any of your eye care and vision needs. We offer Urgent Eye Care should you need it. Please feel free to give us a call at any time.